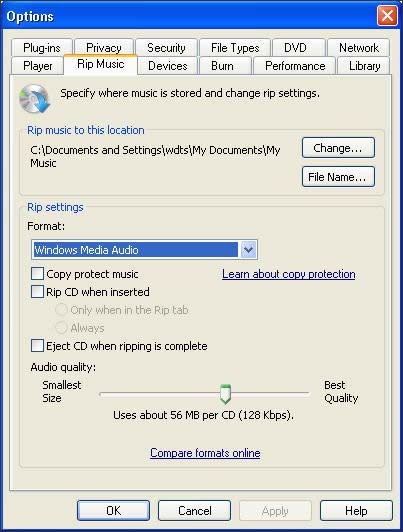 Open Windows Media Player by selecting: Start > Programs (All Programs) > Windows Media Player. En Windows 10, haz clic en Start > ícono Apps (located in the top-left corner) > All apps (located in the bottom-left corner) > Windows Media Player. From the Rip tab, click More Options. 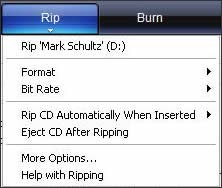 From the Rip Music tab, select Windows Media Audio as the Format, ensure the 'Copy protect music' checkbox is not checked then click OK. If the 'Copy protect music' is checked, converted files cannot be synchronized to the handset. Asegúrate de haber seleccionado las canciones deseadas. If prompted, select 'Keep my current format settings' then click OK.
Click Start Rip (located in the lower-right corner of the window).